Well, I haven’t been to school in two days so far. Do you think I care? Just a bit. It’s my habit of wanting to be an A+ student. I’ve spent most of my time here at home, and I even joined and posted on Nihon Expats! Who would’ve thought that I would find such common ground? I’ve somewhat started some Japanese lessons from this website. It’ll be interesting to see if I remember any of it since I don’t speak it from day to day. I should print out the notes and just stare at them all the time, vocalizing everything and getting unwanted stares from other people (as a method of demeaning others). But, I digress. Forget it, I have no idea what I just said. I just woke up, d00dz!!! My website …my poor, poor website. I probably might not be able to afford it when I live in Japan. Maybe I’ll just keep the JGirlChaser.com and get rid of HIOS.org. After all, there won’t really be a HIOS.org once I’m in Japan, will there? 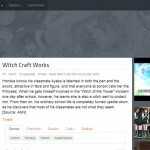 I’ll keep all my written works and artwork in JGirlChaser.com, but that’s it. Other than that, I have no idea what else to do. Good help is so hard to find these days. A five-year plan. Heck, most people don’t even have two-year plans or even one-year plans! I always thought of myself as a ten-year plan kinda guy. In a year’s time, if I decide to stay in school, I plan to graduate and get a job somewhere. Wal-Mart or Radio Shack or something. Just no more computer servicing. I’m retiring! However, on the other hand, if I decide not to finish school, then I’ll just go for a job immediately. At the same time, I’ll be spending the rest of my free time learning Japanese. I don’t care if I have to cancel my internet and disassemble my computer (well, not THAT badly, but at least make a schedule), I’m going to learn Japanese! After approximately a year of working, I should have enough money stowed away to do either two things, depending on the circumstances. If Hidetoshi decides to move back up to Thompson, then as I discussed with Megs, I’m opening a video gaming store. There’s a lot of market for video game sales up here. I won’t JUST be selling video games either. I’ll be selling video game consoles, strategy guides and stuff, PC games, PC gaming hardware and peripherals, and quirky import items from Japan like game soundtracks, import games, trinkets for your car or personal items like keychains and stuff. All video-game related. I may even sell anime and manga, depending on the size of my outlet. Not only that, but I’ll be offering ordering services, used games resales, store credit accounts, in-store gaming displays, useful hints and information, and maybe a few public internet terminals (with high speed, of course). I may even get Sanrio merchandise as well, but that’s just the fun stuff on the side. I have no idea what to call it yet, though. But I know “HIOS” must be in there somewhere! Of course, Hidetoshi and Megs are guaranteed high-position jobs. Hehehe. If Hidetoshi doesn’t move back up to Thompson, then I’ll be taking a short trip to Japan (maybe a week or two), just to dip into the culture for a short while. When I return, it’ll be back to the meat grinder of work. Either way, I’ll also be building my Japanese vocabulary and studying Japanese history and culture. After another year of that, I plan to spend another year working, and studying Japanese literature and colloquialisms. However, during this time, I’ll be online, looking for some Japanese friends (or girlfriends) and establishing good friendships. Hopefully, I should be able to get one of them as a sponsor (or even better, a fiancée). That’s when the application for Japan begins. For two years after that, I see myself living in Japan and getting used to the culture. My business will still be running back in Canada, but it’ll be in the hands of my bro and sis. If they don’t want to take care of the business, then I’ll sell it before I leave. For five years after that, I see myself settling into a career in the anime industry, and getting married with children. I hope to own a traditional house with a garden after 5 more years, or even before that. Okay, so I lied, it’s more of a 10-15 year plan. I don’t plan to follow it line by line, because I’m experienced enough with life to know that sometimes you get dealt different hands that give you new choices. But, either way, I don’t plan on growing old in Canada. Anyway, I’ve ranted enough to make up for not updating so often. Ja ne, minna-san, and thanks for listening! Well, To-Ya is actually a Korean group that also sings J-Pop, just like SES, but this song is just so addictive with all its layers (and the hot PV of these dancing beauties). I’ve had this song in my head for a while now, even through my depressing time. It’s funny how even though I’m depressed, I’m still listening to J-Pop! Anyway, should you ever get the chance to see the PV, I highly recommend it! It’s so infectious, even after just one listen.